After working this past week, I have a new found love/disdain for upper extremity fractures in kids – not sure how 5 kids coordinated their injuries to all arrive at the same time… but it gives me hope for our future generations. oThe x-ray of the elbow often causes palpitations in us/me. Looking at all of those radiolucent areas can be confusing. o The fracture line may not appear until 7-10 days after injury (trust your exam… splint liberally). 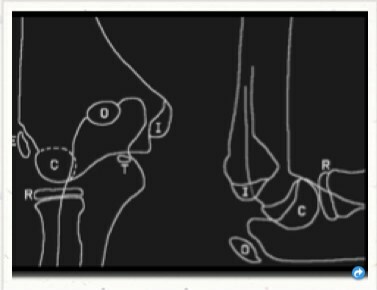 o It may be difficult to diagnose and will often appear as a Salter-Harris II fracture, but in fact, the majority will be Salter-Harris IV and are highly unstable. o Management: only truly non-displaced fractures can be managed non-operatively. Significant soft tissue swelling likely indicates unstable fracture. Casted fractures that appeared non-displaced may become displaced so close follow-up is needed. Most will require operative pinning. o Complications – Non-union with growth arrest, avascular necrosis, valgus/varus deformity, Ulnar nerve palsy (although not acutely – the risk of neurovascular compromise is much lower than supracondylar fractures). Sarraff, LM. and Haines, CJ. Common Orthopedic Injuries in the Pediatric ED. Pediatric Emergency Medicine Reports. 2010; 15: 77-91.